For the first time in three centuries, there is no one living on the island of Barbuda. All 1,700 residents have evacuated to the sister-island of Antigua following Hurricane Irma, the Category 5 storm that damaged an estimated 95 percent of the structures on the island. The island nation faced heavy rain and winds earlier this week as a result of Hurricane Maria, a Category 4 storm, which made landfall in Puerto Rico Wednesday. “For now, there is just the focus on relief, and recovery efforts and of course beyond that will be the broader discussion of a rebuilding and reconstruction of a new Barbuda. It will pretty much take a rebuilding of the island,” said Garfield Burford, an ABS Television/Radio director of news, told NBC News. That rebuilding is expected to come at a steep price tag: between $250 million and $300 million — money the island nation's ambassador says they could afford if the U.S. paid what it owes as the result of a 14 year trade dispute over online gambling. When online gambling became popularized, some companies located on the island nation. When the U.S. began cracking down on many of the sites' operators as part of a broader focus on restricting American online gaming, Barbuda said those efforts had a negative impact on its own economy. In 2004, the World Trade Organization ruled that the U.S. had violated trade agreements by not allowing online betting from websites hosted in Antigua and Barbuda. An appellate body upheld the same decision the following year. An arbitrator measured Antigua and Barbuda’s losses at $21 million a year and, because the country did not receive payments from the U.S., they were permitted to circumvent American intellectual property rights to cover their losses, according to the WTO. Antigua and Barbuda have an annual GDP of $1.5 billion. “We feel a little disadvantaged by this process. We’ve been trying very hard over 14 years to get the U.S. Trade Representative's Office to reach a reasonable settlement with us," Ronald Sanders, Antigua and Barbuda's ambassador to the U.S. told NBC News. "If they were going to do it, there would be no better time than now to allow us to rebuild our country on the basis of money which we have lost because of the United States’ action and which has been arbitrated fairly and squarely and legally in our country's favor." The Office of the United States Trade Representative did not return NBC News' requests for comment. Meanwhile, members of Congress are calling on the Trump administration to offer temporary humanitarian immigration status to foreign nationals in the U.S. from countries in the Caribbean impacted by Hurricane Irma. A bipartisan coalition of 75 representatives signed a letter addressed to President Donald Trump urging him to grant Temporary Protected Status for affected countries like Antigua and Barbuda and the Dominican Republic, among others. “There’s a strong commitment, both Democrats, and Republicans, to help rebuild and recover, but in the meantime, they have no place to go. So we’re just asking for this status to be provided for them,” said Rep. Barbara Lee, D-Calif., told NBC News. Some believe a stay in the U.S. on temporary protected status could be a welcome change from the hurricane shelters of Antigua. Though humanitarian assistance is already underway for the homeless in Barbuda, officials there said it could be weeks to months before the island nation is habitable again. Stagnant flood waters remain on the mostly-flat island, raising fears of mosquito-spread illnesses. 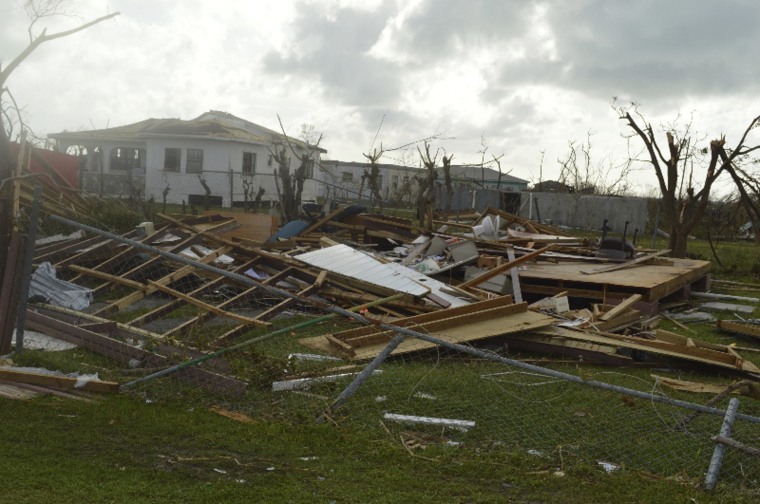 USAID said they are supporting the Barbuda Red Cross Society to provide emergency relief and are preparing to airlift supplies pending weather conditions. “I’m sure there would be Barbudans who would have family in New York or wherever and I think it would be very helpful to go and live with family for a few months instead of having to live these accommodations,” said Karen Corbin, president and executive director of the Antigua and Barbuda Humane Society. The Department of Homeland Security has currently designated ten countries for temporary protected status based on the determination that the foreign nationals' home countries are unsafe or unable to adequately handle their return. Individual countries must request temporary protected status before it can be offered by the U.S., and no requests had been made as of Sept. 12 according to the Department of Homeland Security. Currently, Haiti, which also faced widespread damage as a result of Hurricane Irma, is one of the countries designated for temporary protected status. That nation first received that designation in 2010 following a devastating 2010 earthquake that killed 220,000 and displaced 1.5 million. In May, DHS issued a 6-month extension to the program for Haitians that had been previously implemented in 18-month intervals three times by the Obama administration. The Trump administration will decide this November whether or not to extend temporary protected status to the roughly 58,000 Haitians living in the U.S.
“There is no point to that. Any Antiguans and Barbudans that are in the United States are not there as a result of anything that happened in Barbuda," said Sanders who added that any Barbudans unable to return home are able to live on the island of Antigua which largely avoided the wrath of the storm. "For the most part, they would be citizens or green card holders." Ben Remaly is a desk assistant in NBC News' Washington bureau. He previously interned at WETA, BBC News and at Bloomberg BNA in the environmental news division. He graduated with a journalism degree from George Washington University.